Last updated: 26 February 2014; Charter created and branch establsihed. 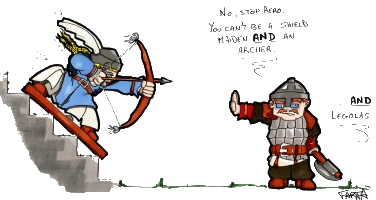 The Guard of Istiniar, the acronym of which is 'IG', is a War of the Vikings clan and is a branch of the multi-gaming community of the same name. This branch is dedicated to the vanilla game of War of the Vikings. From henceforth, the Company can be taken to refer to the multi-gaming community, Guard of Istiniar, whilst the Branch will be taken to refer to this clan for War of the Vikings. As a Branch of the Guard of Istiniar Company, this Branch follows the Constitution of said Company. The Company Constitution takes precedence over this Charter, and the leaders of the Company may make decisions regarding this Branch’s future, including over-ruling the Director of this Branch, and making alterations to this Charter. This Charter was written in accordance with the Constitution of the Guard of Istiniar Company, to ensure that the atmosphere inside the clan is good for our members, to gain and keep a reputation on the outside as a mature and nice clan and to have a competitive clan with members that follow a hierarchy and orders so that organized and effective playing becomes easier. This Branch is an international, competitive as well as casual clan for War of the Vikings (WotV). We play regularly on public servers and have regular trainings and matches. A highly held principle in both this Branch and the Company, is that our members behave decently and maturely. Therefore we make a point not to recruit those who are immature or malicious, no matter how skilled they may be. No illegal actions, or the promotion of such. Of course, it is important that you also read and understand the Constitution for yourself, this list is merely a reference point. Every six months an ordinary election will take place, in which the Director of the Branch will suggest a list of candidates for the Branch Leadership, created with the input from the clan-members. All members with the sufficient rights (i.e. Footmen upwards) have ten days to anonymously vote (Yes/No) to confirm or reject the candidates proposed by the Director. Should one candidate receive less than 75 percent positive votes, the Director has to confront the members about their reluctance to that leader, their reasons and their preferred choice. If no sufficient reasons or alternatives are brought forth in one week time, the Director may decide to accept or reject the candidate as (s)he wishes. If more than 50 percent of the members of the Branch voted against the candidate, then the Director must reject the candidate. Any election, which promotes a member of the Company to the Steering Committee of the Branch, must be ratified by the Executive Committee of the Company. If a member of the Military Section does not come to any training in four weeks without valid explanation (a vacation is a valid explanation, forgetting trainings is not) he may be retired to Civilian. ok the above posts shows the use of anchor tags. Atm only the preamble and glossary tags are set in the text. When you click the word in the index at the top of the post (eg 'preamble') you are taken to the tagged text elsewhere in the same post. It is possible to tag to parts of posts on diferent pages but that is slightly different coding. I never knew you can do that! Oh my god Aerowen, you are amazing. I knew it was possible but not how. I have not quite worked out how to link to anchors in other posts, I know the theory but I cant make it work. I will keep looking when I have time but if anyone else knows I would be glad to hear it. Did a quick google search and found nothing useful on how to link to a tag in a post in another thread. The links to posts are of this format: http://forum.guardofistiniar.org/index.php?topic=2957.msg95751#msg95751 so I wondered if the last msg95751 behind the # could be replaced by the tag-name in that post, but that doesn't work. Neither does it when you add .tag-name as in #msg95751.tag-name... Would be great if someone knows how to do this, as this would greatly simplify linking to paragraphs in the Constitutions and Charters. We could even have the links in code below the paragraphs so people wouldn't have to write them every time when they want to link to something. Thanks for figuring out how the internal linking works, Aero! Added a table of contents to the Constitution. For a ToC it is important to use the iurl, as otherwise the link will open in a new tab. Also added url-links to the anchors in code-boxes to simplify linking to the Constitution from other posts. I just deleted most of the middle of my example post as we have a working example now anyway.